Costs – How much does tree removal, tree maintenance and stump removal cost in Brookfield, Wisconsin? Find that data here. 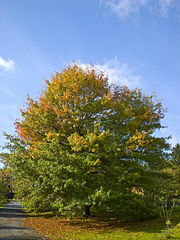 FAQs – Thriving trees, current pests, regulations and rules — Brookfield, Wiconsin’s up-to-date tree information is here. Services – Contact a local Brookfield arborist today. How Much Do Tree Services Cost in Brookfield? The city of Brookfield is on the southeast side of Wisconsin and near the west bank of Lake Michigan. As Wisconsin’s Forestry Department is the second largest employer in the entire state, it’s clear Wisconsin values its trees. The forests of this beautiful northern state are full of both coniferous and color-changing deciduous trees with a rich variety. In Brookfield as in the rest of the state, land-owners must take care and educate themselves as to regulations and tree facts that will help their property’s trees to thrive. When a tree has become diseased, unstable or is in the way of development, there’s nothing to do but have it removed by professionals who know and abide by safety and city regulations. Tree removal can range from $2,200 to $3,600, depending on the number of trees and difficulty of the job. Despite the cost, it is highly advisable to leave these jobs to the professionals. The average cost to grind and remove a medium stump in Brookfield is from $78 to $140. Larger stumps will see similar prices, with an average as high as $80 to $140. Tree maintenance is important for the health and aesthetics of trees. Tree overgrowth can also be a concern for homeowners dealing with power lines, roads and sidewalks. When trees are regularly maintained, it is less dangerous and time consuming to deal with them. Most homeowners in the area spend an average of $460 to $700. The trees of Brookfield, Wisc., are many and varied, boasting both coniferous trees that resist piling snow to stay green in winter and deciduous for a virtual autumn rainbow. The city prides itself on measures and regulations to preserve the oldest heritage trees and promote the growth of new trees for future generations. In Brookfield, the city government is responsible for all trees in the right of way, even on residential property. The ROW is generally designated as the area that extends 30 feet from the center of the road, but this can vary do to a number of factors. 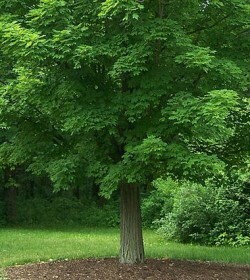 Homeowners are responsible for other trees on their property and are required to maintain them so that they do not pose a threat to public property or the property of neighbors. Brookfield has also established regulations meant to help preserve multi-generational trees and the tree heritage of the city. Residents can contact the UW-Extension Horticulture Helpline for more information. Brookfield has a forestry department which, like in other cities, is tasked with maintaining trees in the right of way and ensuring these trees remain healthy and unobtrusive. Homeowners should carefully consider the mature potential size of any trees that are being planted in any location, but especially those near power lines, signs or any other official structures that need to remain unobstructed. Permission to plant may be required when adding plants to the right of way. Dead trees or trees that pose a hazard of falling, especially under the weight of a heavy Wisconsin snow, need to be dealt with as soon as possible. Otherwise, the best time to prune and trim deciduous trees is after the worst of the cold weather is over and while they are still dormant, usually in early spring. Even fruit trees are possible, with varieties including apple, nut and stone fruit. Some of the best recommended fruit trees to grow in Wisconsin are plums, Asian pears and apricots. Homeowners who are looking for a tree that will remain manageable and small should look into the Robinson crabapple. A small flowering tree with edible fruit. While the apples are not the best for eating, they will attract wildlife and the tree’s beautiful blossoms in Spring will beautify any yard. Among some of the tallest growing trees in the state are the black spruce, peachleaf willow and northern pin oak. These three trees have the honor of specimens that are currently Wisconsin records. 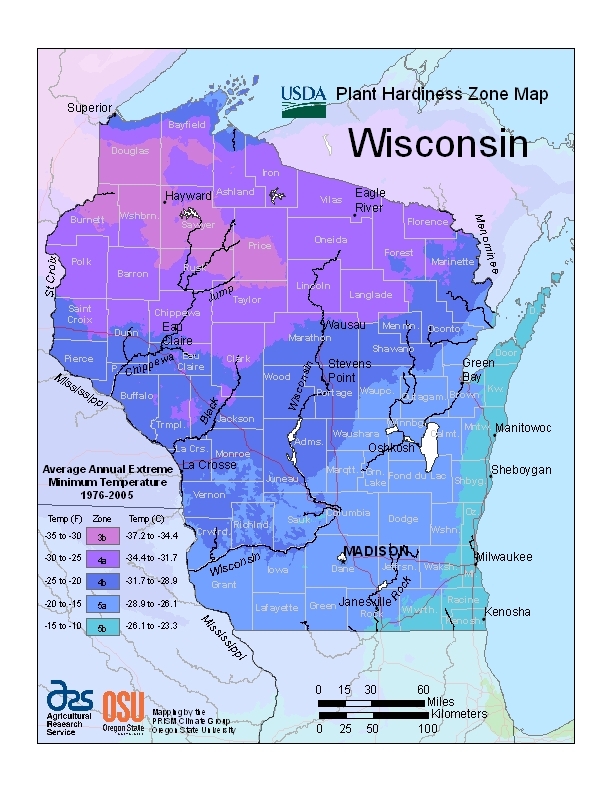 As with all areas, there are certain pests and diseases which are commonplace in Wisconsin. Homeowners need to be vigilant in making sure any sign of disease receives continued observation and timely treatment. The emerald ash borer is a well-known Wisconsin pest. It was unfortunately introduced to Wisconsin and was first seen in 2008. This beautiful insect is causing great damage to the state’s Ash tree population, but solutions are available which can be used to protect trees, usually requiring annual application. Another one to look out for is fire blight, which is the number one disease threat to trees and shrubs in the Rose family. Plants afflicted with Fire Blight will have leaves, stems and even branches turn black, resembling plants scorched in a fire. Fire Blight cannot be cured, but cautious pruning can help prevent the spread of the bacteria to other parts of the tree or other trees. Ornamental and fruit trees in the rose family are also susceptible to scab. Scab is a fungus that begins showing up as lesions or small brown to olive green spots on leaves. Fungicide treatments are available and should be applied regularly in wet weather.